Penn State is planning to establish an international research center dedicated to the Search for Extraterrestrial Intelligence (SETI), an initiative that would be one of only a few academic SETI research centers and would offer a graduate program training the next generation of researchers. The university announced last week the first two donations, totaling $3.5 million, toward creating the Penn State Extraterrestrial Intelligence Center. SETI is an international scientific effort that seeks to answer whether ours is the only technologically-capable species in the Milky Way galaxy. Jason Wright, an associate professor of astronomy and astrophysics who will lead the center, told Science Magazine the field has been lacking in academic training. SETI also has been lacking in financial support since 1993, when Congress prohibited NASA from funding it. Wright told Science that the prospect of no funding and few jobs has discouraged researchers from pursuing the field, and that he had identified only five people with doctoral degrees in SETI-related research. Penn State will draw on its infrastructure and expertise to provide PSETI with endowment funding and administrative framework. 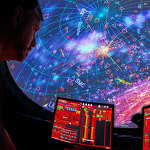 The university's existing astronomy and astrophysics departments and centers make it a "natural home" for a new center. "It offers the breadth and interdisciplinary nature that are a necessary foundation for SETI research, and its deep heritage and leading departments in SETI’s component disciplines makes it an ideal host," according to the PSETI website. PSETI will create a "world-class SETI research program," establish graduate curriculum to train the next generation of researchers, initiate a competitive research grants program, coordinate conferences and symposia and establish a permanent, worldwide SETI community. Penn State alumnus John Patton and his wife, Natalie, have made a $2.5 million gift commitment for an endowed fund to support research activities in the new center. An anonymous alumni couple also made a $1 million pledge to create a new professorship in the Department of Astronomy and Astrophysics in support of future PSETI research. According to PSETI, Kepler space telescope discoveries indicate half of all stars may have Earth-sized planets within their orbits, many within habitable zones. "Exponential advances in computing technology and telescope design, combined with imaginative search strategies, could lead to vastly more powerful and effective SETI experiments than have been possible in the past—if only reliable, longer-term funding were available," according to the website.